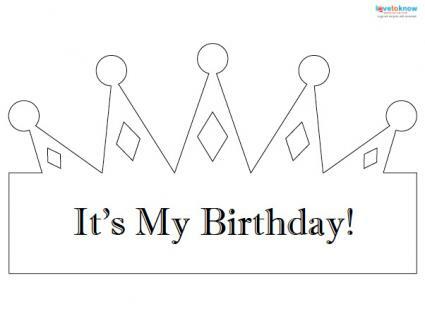 Download this free birthday crown craft. A paper crown is a simple project that will provide hours of entertainment for your kids. Whether your daughter is pretending to be a princess or your son wants to be "King for a Day," making a paper crown offers a great opportunity for creative expression. This printable crown craft can be completed in just 15-30 minutes. The project is easy enough for preschoolers to complete with minimal supervision, but versatile enough to be customized to suit an older child's interests. 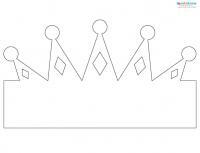 Print the crown design of your choice onto sturdy white cardstock. The featured crown designs are available as downloadable PDF files that should be saved to your computer and opened using the free Adobe Reader program. 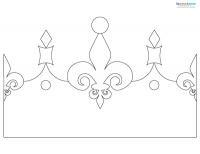 Color the crown as desired, using markers, crayons, colored pencils, or watercolor paint. Add a bit of sparkle to key areas with self-adhesive gemstones, glitter glue, and/or metallic markers. Carefully cut out the crown shape. If you're crafting with a young child, remember to provide appropriate adult supervision in order to prevent injuries. Cut a strip of cardstock that measures 2 ½ inches tall to use as the band for your crown. Use the fabric tape measure to measure your child's head. Cut the band about an inch longer than this length. Tape or staple this cardstock strip to the original crown shape, adjusting as needed to fit the child's head. Alternatively, you could use a length of wide grosgrain ribbon or elastic to create the crown band. If using elastic, cut the band slightly shorter than your child's head measurement. While crowns are fun for kids to make on their own, making paper crowns is a great group activity as well. When the children are done designing their crowns, they can create a play about life inside a royal kingdom populated by kings, queens, princes, and princesses. However, if you're planning to have a group of children work on this project, you'll want to make sure all of your supplies are neatly sorted before the activity begins. Create different "stations" with crayons, markers, and other supplies before having the children move in an assembly line fashion to design their crowns. Young children are notorious for short attention spans, so anything that can minimize disruption will be useful in creating a more enjoyable crafting experience. Aside from being fun dress up props, paper crowns can also be used as gifts to make a birthday boy or girl feel special. These are especially fun at birthday parties and to celebrate a birthday at school. 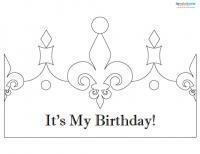 Have your child decorate the birthday crown using the recipient's favorite colors. Personalize with stickers showing the recipient's name and how old he or she is going to be. If desired, have your child write a message to the birthday boy or girl inside the crown before completing the final assembly. For an extra-special birthday treat, take the royal theme to the next level by creating a coordinating scepter. Simply attach a small Styrofoam ball to a dowel rod, then cover the entire base with shiny ribbon or metallic spray paint. To make a simple cape, try stitching or gluing a ribbon tie to the top of an old velvet curtain, or even an old sheet or blanket. Add a monogram or appliqué to the back of the cape if desired. ArtBar explains how to make paper bag crowns decorated with pom-poms, glitter, and watercolors. Meaningful Mama has a clever tutorial explaining how to turn a paper plate into a colorful crown. The Etsy Blog showcases David Morgan's surprisingly elegant-looking gold paper crown made with multiple two-inch folded paper squares. Origami Instructions has a tutorial explaining how to create a crown using folded interlocking squares. Once folded, the crown can be decorated however you desire. Crayola offers instructions for making a Scandinavian Christmas crown. Regardless of how you choose to create your crown, this fun paper toy is sure to provide hours of entertainment. You may even find yourself making an entire wardrobe of paper crowns for your child to enjoy.